A driver license is required for which of the following? I. Sitting in the driver's seat of a car while the engine is running. II Steering a car while it is being pushed or towed by another vehicle. If you do not have a valid driver license, it is illegal to sit in the driver's seat of a motor vehicle while the engine is running or to steer a motor vehicle while it is being pushed or towed by another vehicle. Drivers should try to see ____ ahead on the road. Good drivers try to see 10 to 15 seconds ahead on the roadway. By looking ahead, you may avoid unnecessary last-minute moves, such as sudden stops or quick lane changes. Regulatory signs require drivers to obey an indicated instruction. Failure to comply is subject to penalty. Continue to drive in a normal manner. Speed up to get out of its way. Slow down, move as far to the right as possible, and stop. If you are being followed by an emergency vehicle that is not using its siren or flashing lights, you do not need to clear a path. Continue driving in a normal manner. White lines are used to separate traffic moving in the same direction. Solid lines indicate that drivers are not permitted to pass. 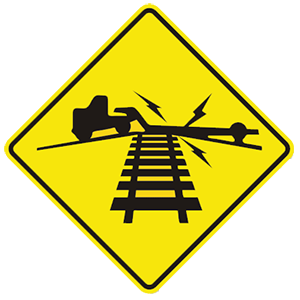 This sign indicates a low ground railroad crossing. Where this sign is present, railroad tracks cross the road at a steep slope and the bottom of low vehicles may drag or get caught on the tracks.